Appa from Avatar the Last Airbender! 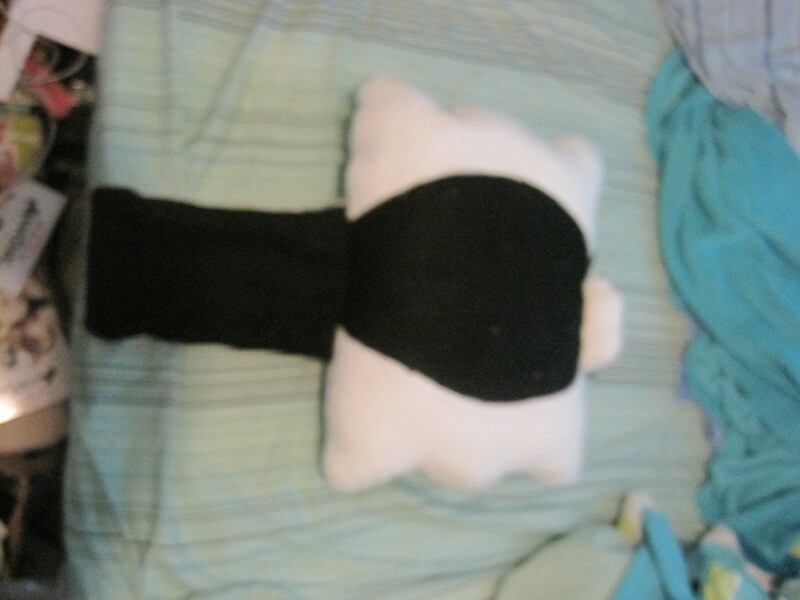 My family and I had a marathon and I decided I wanted a plushie Appa, so I looked around and found crazy prices and way too long on shipping, so I made my own in about four days, working only a few hours every day. I used Ultra Cuddly fleece and its name is definitely well earned, and just black and brown fleece for the rest of the big parts. 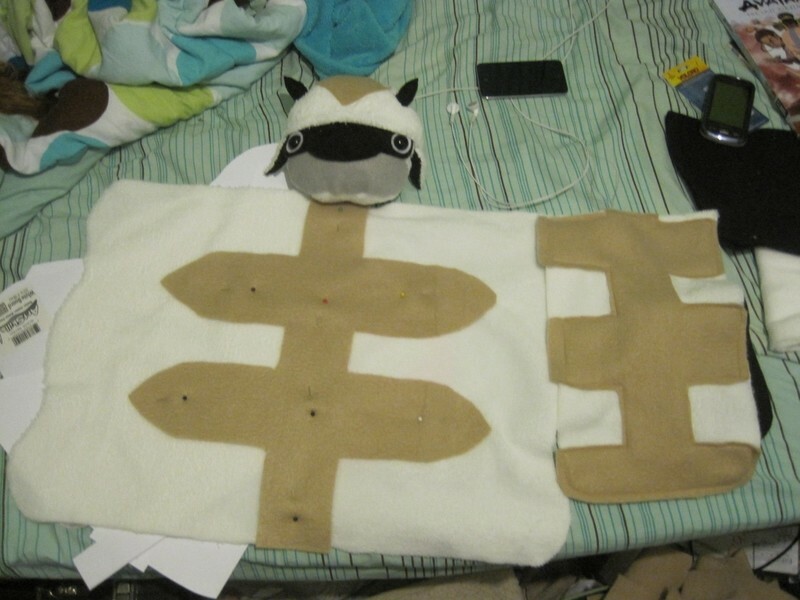 I used gray fleece for the muzzle and white for the eye stuff. 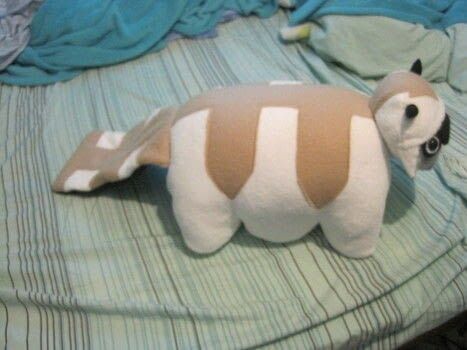 I'm pretty proud of it, cuz its my first kind of animal plushie. If you need any clarification, feel free to comment/message me! You need two poster boards and some cardstock can be handy if you mess up or run out of poster. 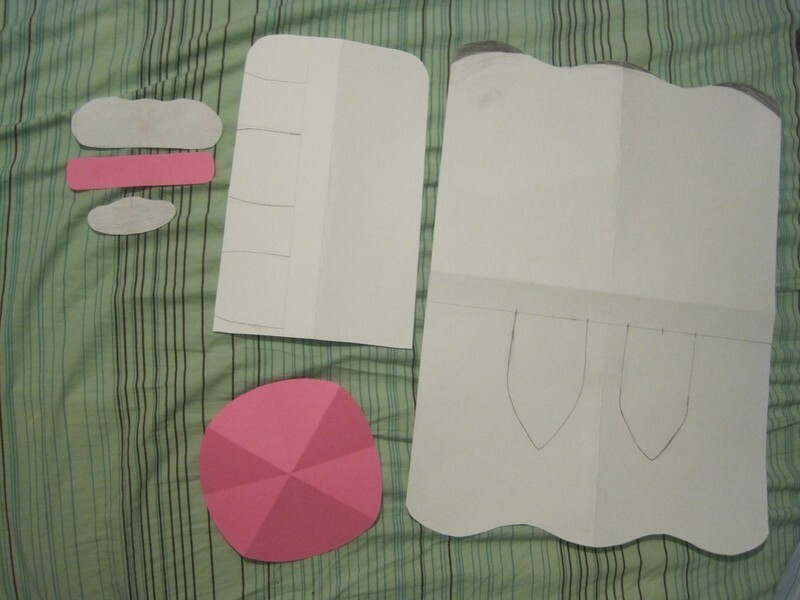 I suggest using the pattern pieces I have here and the downloadable one above as a guide. To get the sizing just so, I suggest using ratios. Length of this pic's body over length of its tail=length of your body over x to find out how long you should make the tail, etc. You need two body forms- one for the top and one for the bottom, but they should be the same size. On one, draw the brown markings, and on the other draw his belly. You can do with only one, but it gets a bit confusing, so I recommend using two. Make one tail, and draw the markings, making sure that the middle line is the same width as the one on the body. The ears and horns you'll need to do after you get the face, so you make sure they fit just so. This parts a bit odd. -Take your eyes, and cut two white circles of felt so that they slightly surround the eyes. 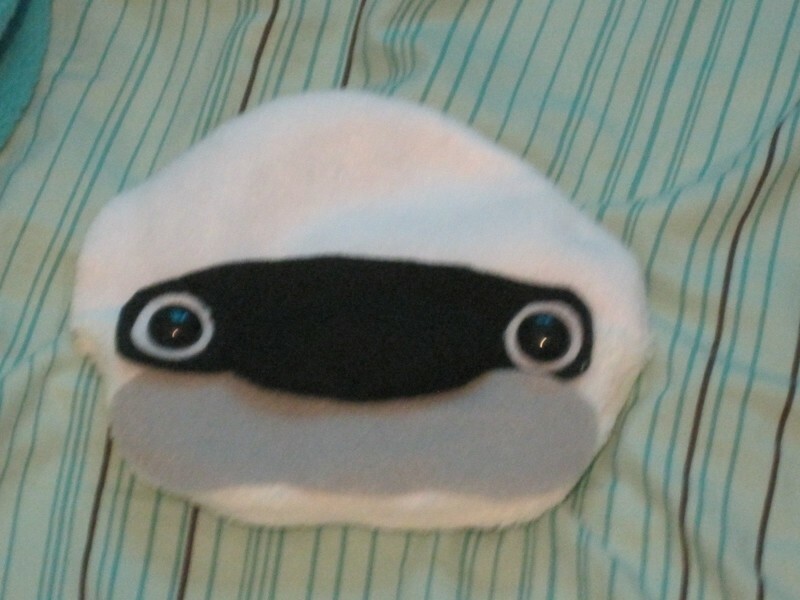 Attach the eyes to the felt, the felt to the eye mask, and the eye mask to one of the white circles. I used what I think might be called screw eyes? you stick the back through the fabric and lock it in place with something like a washer. And that's all I used to attach all that. Attach it so the the top of the mask is *slightly* above what would be the diameter of the circle. 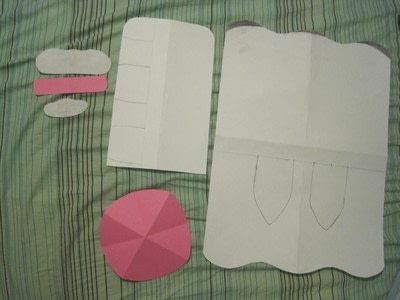 -Take this and the other circle piece and sew them together, right side and eye side in. SEW ONLY HALFWAY AROUND on the bottom half, flip it out so that you see his face. You can kind of see how I did this in the picture. 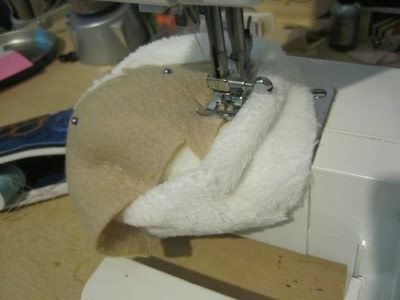 -Now attach the muzzle by either sewing or using fabric glue (that's what I used). The reason this is done after sewing half the face, is so that just in case the face cuts in a bit smaller, the muzzle will have a muzzle shape. 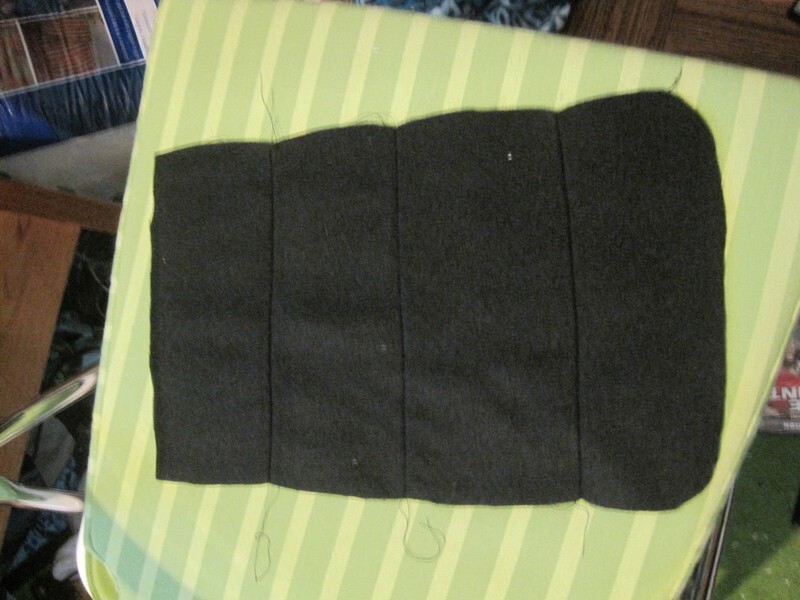 -Flip in inside out, sew the top a bit more, flip it out, stuff it, and sew it closed. -Pin the arrow on top the cap and sew it on. This is where you may want a sewing machine, as the stitches will be visible. -Start with the ears, and make them however you want. I made two somewhat rounded triangles, with the outsides white, and the insides black. I sewed them together right sides in and then flipped em out, not sewing the bottom part, because that will be hidden. -Sew or glue down the hair. I fabric glued it down a bit above the bottom, so that it stayed put, but had some movement to it. -For the horns, I did some little baby ones like in the cute flashbacks Appa's Lost Days. Just two sets of two triangle sewed together. I stuffed em a bit, them sewed em down above the eyes. The head is now finished! It was a lot of work, but it's almost over. This is one of the easiest parts. Take the markings for the body and the tail and line them up in the middle of each, pin them, and sew them like you did the arrow. Line up the three pieces of the under part of Appa, and make sure that it is still the same shape and size of the top part. Pin the pieces, and sew them together. 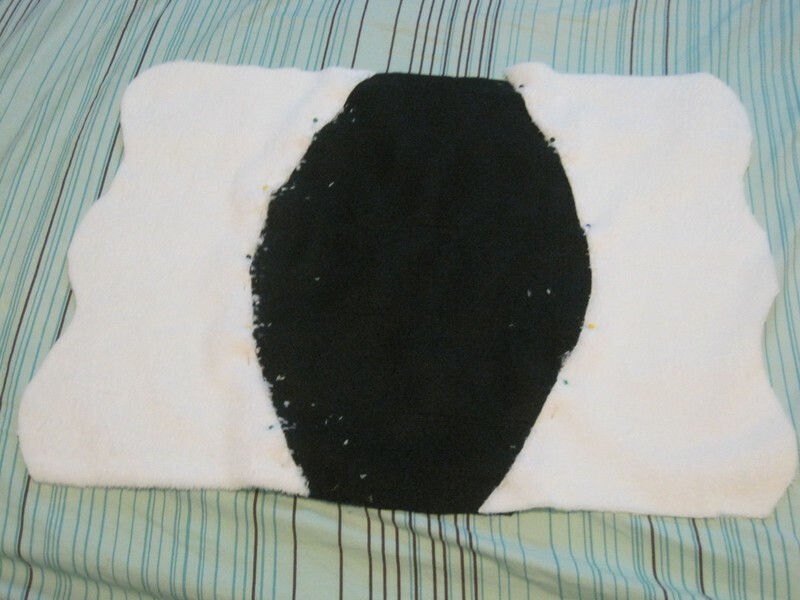 Make sure that you position it so that when this part is finished, the black belly will be under the white fur. I didn't take any pictures of this step so bear with me and enjoy Appa's belly! 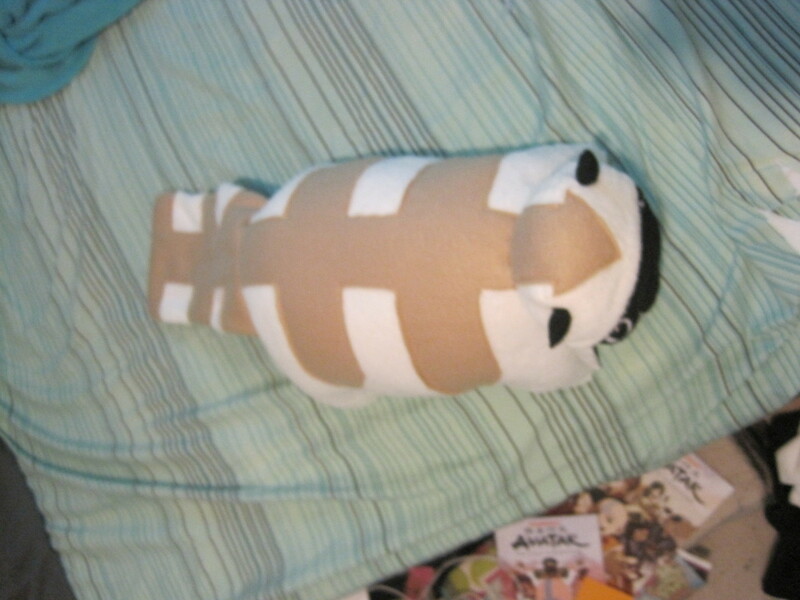 Take two pieces of the soft velcro, and sew one between the first leg and middle leg, and the other between the middle and third/about where the brown markings are/the little indents between his feet. Cut two pieces of white fabric the width of the velcro and six inches long. 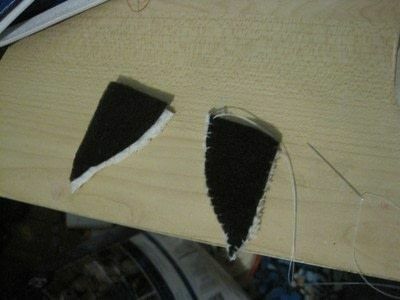 Sew the hook pieces of velcro on both of these. Align the top and bottom pieces so the the good parts face in. Pin the top part, and about halfway down each side. Slide the tail in this little sandwhich so that the marked part touches the marked part and the black part touches the belly. Leave a s small bit hanging out, pin it there, and sew. Do this first so that those thick layers of fabric don't jam your machine after you've sewn half of his side and so that it doesn't move around or fall out of its pins while you sew the rest. DO NOT UNPIN the pieces! We'll go right into the final sewing. In the same way you did the tail, slide the two pieces of fabric with the hook velcro at about the same spot as the soft, but on the other side. The Velcro should be facing the SAME way as the soft velcro, so that when the body is flipped out, they velcro together. If the soft is facing down, so should the hook. Start form where the black and white fabrics meet at the belly, and sew until where you stopped for the tail. Now repeat on the other side, still starting at the black and white meeting until the tail. 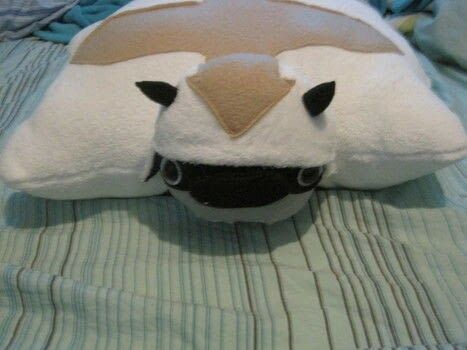 There should be a hole in the middle of spot where the head will go, flip the Appa right side out. Pull the tail through first, and the rest will follow. Make sure the velcro meet up before proceeding! Once you've got him right side out, stuff the body to how you want. Sew the hole closed on the body, but don't make it pretty, as the head will cover this. Position the head in the spot you want it, but make sure the stripe still lines up. Sew it to the body, starting at the very middle of where it will attach, working its way out in a spiral. Congrats! Your done, and you now have your very own Flying Pillow Bison! Hi I love it! I'm making my own, but I'm stuck, I just don't get how to attatch the head onto the body. Did you close the body first? I think overall, that's the hardest part for me. The head I made looks unproporcional, it's too small for the body I guess. LOVE Avatar!!!!! Hope i finish by episode 4 of Korra!! I have been trying to download the pattern but am unable, my granddaughter wants one so bad! My e-mail is grg0161@yahoo.com.....thanks in advance. LOVE LOVE LOVE AVATAR and would love to make this but i found the instructions a little confusing do you think maybe you could make a video and upload it??? 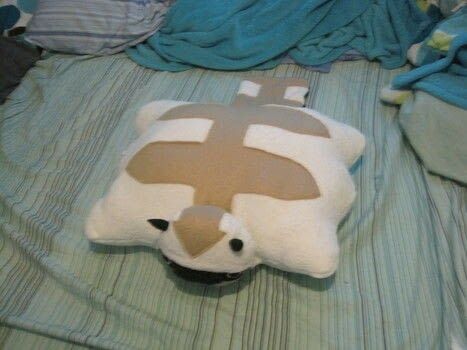 Is this standard pillow sized? did you ever get sent the pattern??? Is there a printable template that is available? can you email me the attatchment?? it wont let me open it.